Throughout history the Elder Tree has been the subject of much folklore and superstition. All parts of the plant have traditionally been used medicinally and it has famously been referred to as ‘The medicine chest of the Country People’. The flowers can be made into a variety of beverages such as cordials and liqueurs, many of which are now commercially available due to renewed interest in the culinary use of this uniquely flavoured aromatic. 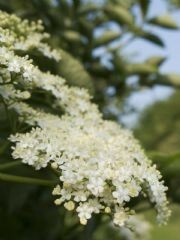 Elderflower is highly regarded by herbalists for the treatment of upper respiratory complaints especially to aid in conditions where there is excess mucous and congestion. Though little research has been done to validate the medicinal properties of Elderflower, studies have indicated that it has the potential to reduce fevers and possesses anti-inflammatory properties.